This book has really helped me with my creative writing class at UD this semester. The readings so far have been easy to follow along with and are college-student friendly aka not too boring! 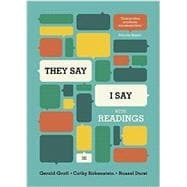 They Say / I Say: The Moves That Matter in Academic Writing, With Readings: 5 out of 5 stars based on 1 user reviews.